50+ Resume Templates in Word, PDF and HTML format. The term ‘technician’s job’ is a bit generalized one. A technician’s job is a specified and specialist’s job. Hence, ideally speaking, technicians’ job can be categorized into various segments in accordance with the area of expertise. The structure of resumes of the aspiring technicians also differs accordingly, depending upon the market dynamics and demand. Still, there has to be a base structure that a technician’s resume MUST adhere to, to be meaningful and conclusive from the employer’s point of view. It can very well be said that the mainstay of a technician’s job is to understand the technicalities of the concerned field and provide technical support. For example, an automobile technician should be an expert in understanding the components of a car and provide support and solve any technical glitch. Thus, a good technician resume should reflect the area of expertise of the candidate including a summary of the area of work that the person in question is expected to do. The resume must contain a sample or two of the achievements so that the employers get an idea about the aspirant. Instead of using a resume template when preparing a technician’s resume, it is better to be specific so as to reflect a true picture of the aspirant. 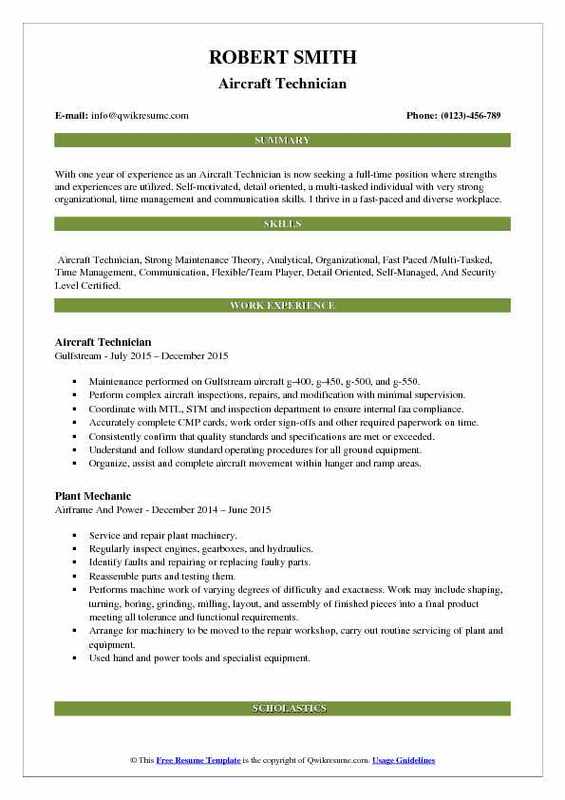 It also has to be the latest technician resume that draws the current picture. Coming to the issue of constructing the technician’s resume headline, there is no need of using fancy or flowery words. The title needs to be clear enough to be understood and yet, needs to be a concise one. When writing the career objective on a resume, one should strictly refrain from writing ambiguous statements and falsification of facts and rosy statements. The more specific the objectives are, the better is the chance of being considered for the job in question. A perfect career objective, for being considered, has to be realistic as well as in tune with the educational background that the job aspirant has mentioned on the resume. In other words, there has to be symmetry between the career objective statements and the educational background. Strategic use of keywords should be done so that there is a maximum chance of the resume to be picked up by the employers. Focus on certain skills and experience related to the job also helps. It should also somehow include an explanation of why the person in question needs to be picked up for the job. Looking for a profile of a technician in a pathological laboratory, where I can utilize all my skills and experience as a head technician. Interested in a senior position in your organization, which will help me use my sound technical knowledge, backed by my ability to work with a team and deliver results. Interested in a position that will enable me to utilize my technical skills for the growth of the organization, while working as a team with companions and seniors. 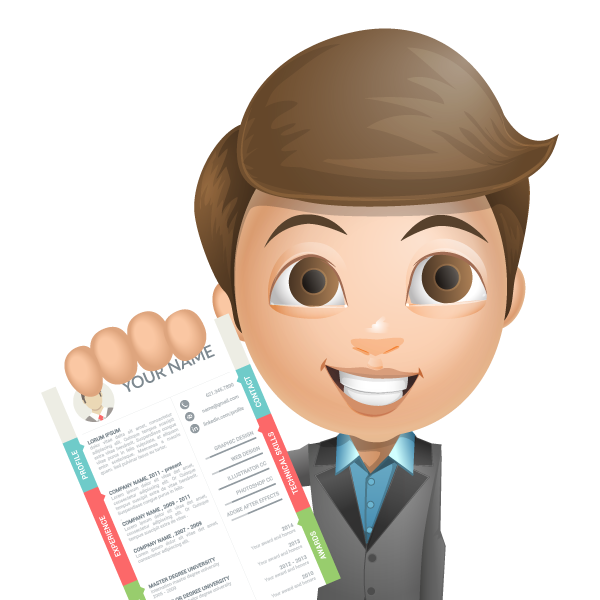 Resume summary statement is actually a concise description that underlines the qualifications of the candidates that may be considered fit by the employer to appoint that person for the job in question. This is a shorter version of profile statement, which provides a brief but a clear picture about the candidate. That is the reason, it is imperative that absolutely concrete and just information is added in the summary, so that it adds value to the resume, enhancing the chance to be picked up by the employer. An electrical engineering technician with an eye for details and 15+ years of experience in working in various industries. When it comes to writing the experience section in the resume, it should concisely and categorically include all the relevant experience. When we pen the term, ‘relevant experience’ it should include the relevant work experience for which the incumbent has been paid. This can include part time or full time jobs, self employment, internships and conduction of projects for which the incumbent has been paid. If the technician is not a new graduate, the person can show 1 year experience, 2 year experience or whatever experience the person has, for the technician’s job. However, this section needs to be written in a precise manner with bullets, depicting each and every experience clearly, containing the start date and end date, in a succinct manner. The section should contain the name of the organizations where the incumbent has been working, the city and the state of the organizations, the job profiles and the designations held by the candidate, periods of employment backed by solid evidence, a brief description of the nature of job done and the responsibilities. These should be mentioned with the help of bullet points chronologically. It is imperative that no experience, which does not have any proof to back up, should be mentioned in this section. The skill section of a technician’s resume includes the job-related abilities of the incumbent. Or in other words, in this section, one needs to highlight the abilities and key skills, which make the person a strong contender for the post the individual is applying for. Though there is a thumb rule of creating this section so as to highlight the list of skills for the job in question, the section needs to be appropriately customized so as to match the profile for which the resume is being created. The better is the match of the technical skills for the job the better is the probability of the resume to be picked up, and the person to be called for interview. One needs to mention some ideal keywords for this section and should use a list of sample skills for being picked up. The keywords depend upon the area of expertise or the type of job in question. 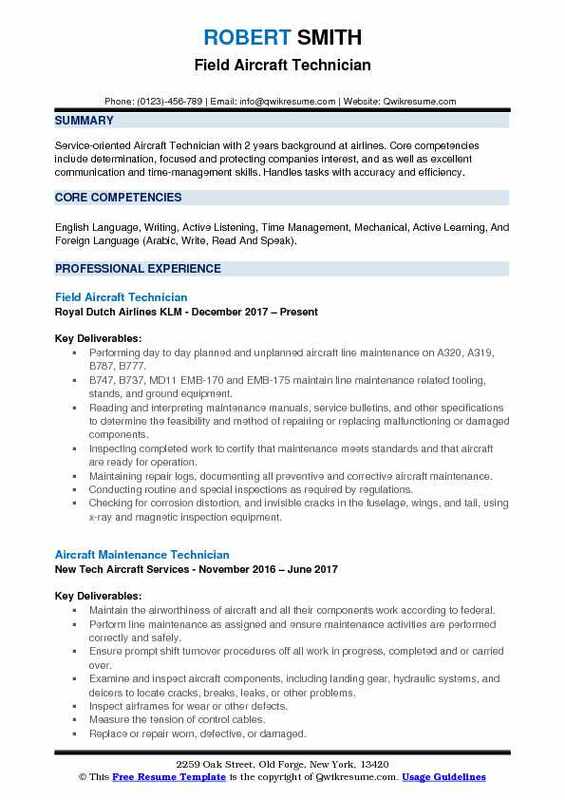 For instance, the keywords for a computer technician will invariably differ from those applicable for an aviation technician. In one word, this section means beating one’s own drum. However, this should be done in the cleverest way so that it does not sound boring or raw self-promotion, which is all but true. Here, the list of key achievements in the concerned field should find a place. The highlights should be mainly on the roles and accomplishments that were achieved while doing the job. Special emphasis needs to be given on instances, which focus on the core competencies in the event of any crisis as that will make all the difference at the end of the day and single out the candidate from the rest of the lot. Understandably, this section should contain the responsibilities that the incumbent has been carrying out in the past in the respective work places. This includes the nature of duty that the person used to do, and the definite job roles. Then again, as there are various types of technician’s jobs available, the type of work and the duty hours varies accordingly. Whatever may be the area of expertise and the nature of the role played, that needs to be penned in a proper and methodical manner so that the employers can understand the extent of expertise of the person in question and the area of expertise and the degree of acumen the person has. This helps the employers to assess the credibility of the person and take steps accordingly. Here are some of the ideal responsibilities of a technician irrespective of the area of expertise. Apart from writing everything related to work, related skills, experience, and other professional hullabaloo, resume needs to have certain lighter sections as well, which will help the employers understand the personality of the incumbent. The resume needs to have the following sections, which will be able to describe the personality of the person and help employees gauge the dynamics of the mentality of the person. Various certifications the person has received on various courses undergone. They may or may not be related to the job in hand. Whether the person has a strong online presence and if so, the social media sites the person uses. The current prospect for the technicians is huge in one word. Irrespective of the area of expertise or in other words, regardless of the technical discipline that the incumbent is expert in, the sky is the limit for a technician today. In today’s market, the demand for technicians is huge. They are sought in many fields – medical, automobile, pharmaceutical, aviation, maintenance, electrical, electronic, computer, and laboratories of various types and so on. The level of education that is needed varies depending upon the profession, but as per a study, most of the companies today need at least a High School diploma or degree. Again, when it comes to medical or pharmaceutical techs, a Bachelor’s Degree and some more certifications are preferred. As per a study every company spends 20 percent of its coffer for good technician’s team and there is no reason one should not find a place in these teams if resumes are prepared properly. 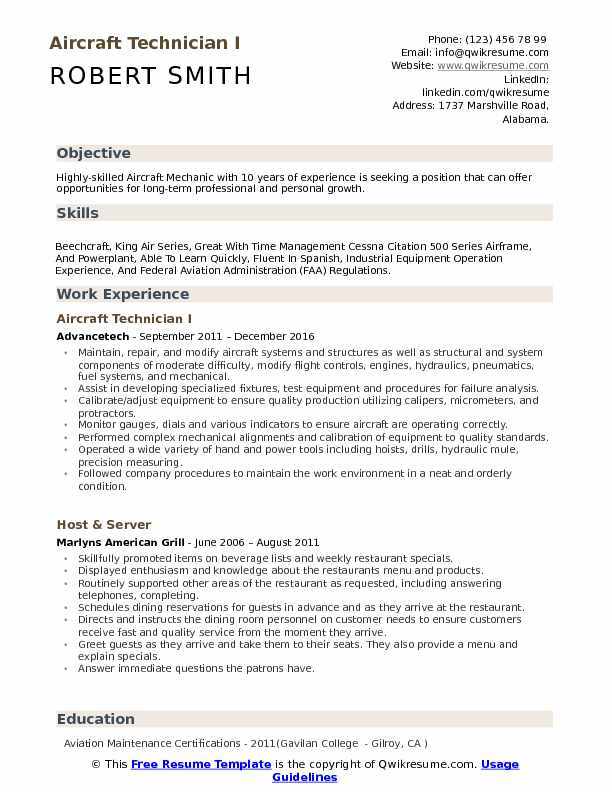 So, all said and done, the resume in question needs to be a perfect one. It is in fact the very face of the candidate in question. Naturally, that has to be made in a perfect way so that it maximizes the chances of the person in question to be called for interview. Of course, it is the performance in the interview that matters the most. Still, a professionally created resume gives a solid first stepping stone prior to that.